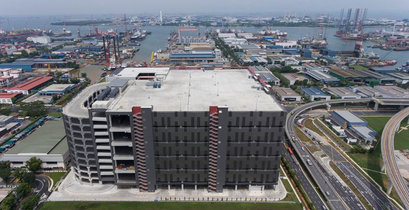 ICD was recently selected by leading logistics company Toll Logistics to design and implement a complex integrated security system at their new Singapore logistics center. With ambitious expansion plans in Asia, Toll built this strategic site to serve as both a regional hub and a local distribution centre. 100,000 square meters in size, Toll City consists of five levels of warehouses, two levels of corporate offices and a large rooftop parking area for trucks and vehicles. The client sought a cutting-edge, integrated security solution which would meet the demands of their security-sensitive clients and would position Toll at the forefront of high-tech security deployment at logistics sites, breaking away from traditional physical patrolling methods. The client required a contemporary ‘defense in depth’ security solution which could be further integrated with other systems within the facility. ICD is a leading provider of integrated security solutions and services in the APAC region with a history of working with Fortune 500 companies and significant experience with logistics clients. During the selection process, ICD demonstrated a detailed understanding of Toll’s requirements and dug deeper to fully comprehend the client’s desired outcomes of the security solution. Toll valued ICD’s efforts to provide a range of solutions with different costs and varying results to meet these outcomes, and decided that ICD had both the expertise and understanding of the client’s needs to successfully implement this security system. Toll City is a large and complex site. Over 450 employees and hundreds of vehicles transition through the site every day, and five levels are in operation 24/7. Toll’s primary objective was to be able to track who was on site at any given time and why. They also expected the security system to help ensure that all operations are carried out safely and securely with the ability to effectively investigate incidents if necessary. Based on Toll’s requirements, ICD proposed an integrated access control, video surveillance and alarm solution combined with a visitor management solution, a vehicle gate system and an intercom system, all managed at an onsite Security Operations Center (SOC). An ICT Protege access control system was the chosen as the principle security management platform. This platform not only manages the site’s 170+ card readers, turnstile lanes and vehicle RFID readers, but was also customized to integrate with the site’s CCTV and alarm systems so that pop-up notifications appear on the ICT system if any events or incidents are detected across any of these systems. One to the solution’s complexities was integrating Toll’s visitor management solution, Rapid Global, with the ICT access control system. Not only was this required in order to effectively grant authorized visitors and vehicles access to the site, but it was also integral to allow Toll to track people and vehicle flow. Working closely with Rapid Global and ICT Protégé, ICD was able to program Rapid Global to automatically transmit data to the ICT system. For the client’s vehicles fitted with RFID cards, site access is a straightforward automated process in which long range readers authorize access by opening gate arm barriers. For vendors, contractors and other visitors, personnel must first go through a strict induction process before registering at a kiosk on site. On successful registration, the kiosk prints a sticker with a unique pin code which can be used at the gate’s keypad readers to access the site. Each pin code is only valid for use once. This ensures that only authorized personnel and vehicles can enter Toll City, and that people and vehicle traffic are effectively monitored and recorded 24/7. Prior to finalizing the exact models and positions of the CCTV cameras, ICD engineers installed various cameras onsite to test the image quality, night and day behavior and angle of view. This was particularly crucial for certain locations in which Toll required specific image quality to be able to identify vehicle license plates and closely monitor activities in the warehouse 24 hours a day. Over 100 fixed cameras were installed around the site’s perimeters and at the vehicle entrances in order to monitor vehicle activity and identify license plates. For the site interior, 230 dome cameras were installed including several fisheye and 360 degree cameras at specific locations where the primary purpose of the cameras was for surveillance rather than identification. ICD successfully installed the complex integrated security solution at Toll City, delivered on time, in line with TAPA Class A standards where stipulated, and in accordance with Toll’s requirements. With a world-class, integrated security solution at the site, Toll boasts some of the best security systems and practices in their industry. The overall solution not only ensures the safety and security of employees and stock at Toll City, but is also perceived as a value proposition for Toll’s customers in sensitive market sectors. Through the successful delivery of this project, ICD and Toll have established a working partnership, common values and a foundation for further cooperation. As Toll expands throughout the region, the Toll City security solution will be held as a model solution which may be replicated at Toll’s future logistics centers in Asia.